On arrival at the airport in Entebbe, the guide will pick u\you up and to Africana hotel in Kampala and subsequent briefing about the whole trip details which is also in your welcome pack. 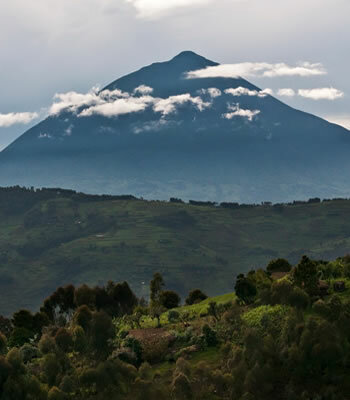 Depart Kampala and travel to Mgahinga National park in Kisoro south western Uganda. The journey will take around 9 hours of drive. Dinner and overnight at Kisoro Travelers Rest Hotel (Medium option), Kisoro Tourist Hotel or Heritage Guest House (Budget Option). This day's trekking will start at Mt Sabinyo (3669m) which offers 3 challenging peaks to climb. This is known as 'Old Man's teeth', time has eroded Sabinyo peak. A climb to the mountain takes one up to peak 1, continue to climb to peak 2 which involves walking a ridge with breath - taking drops into gorges of Rwanda and Uganda, finally the hike up to peak 3 is steep, therefore expect to get your hands dirty as you go to peak 3 and this will be compensated by the spectacular views of Rwanda, Democratic Republic of Congo and Uganda seen on this trek all at the same time. The climate changes here as you begin trekking up front to the peak this ensures the a growth of vegetation (bamboo 60% which is a delicacy of the mountain gorillas, other types are the famous mountain Lobelia, Haegenia and many more plants here). Day 3: Mt Gahinga (3474m). This morning you will hike Mt Gahinga (3474m). This hike takes up to 20km for the round trip. You will go through pure Bamboo forest, trek up to the former crater area which changes into lush swamp, we advise you to set up camp at Muhavura base camp for the night after this trek of Mgahinga for the next day's day trek. (Since this tour is challenging clients are advised to come with tents, Sleeping bag or pads, insect repellent, flash lights. (Food, water and security, shall be provided). Day 4: Mt Muhavura (4127m). After breakfast trek further to Mt Muhavura (4127m); here the best views of the country are found and much of the climb passes rocky surface covered by grass and small shrubs, however, trekkers are rewarded with beautiful views of the Virunga Volcanoes, Lake Edward in Queen Elizabeth National park, Bwindi Impenetrable forest park, and the peaks of Rwenzori Mountains. The trek takes 8 hours round trip covering 15km. Return for dinner and overnight on full board basis. Day 5: Bwindi National Park. Gorillas tracking in Nkuringo. After briefing by the park warden in the morning you will descend and ascend to the steep hills of Nkuringo gorillas, forested, mixed grass indeed making it an impenetrable forest. 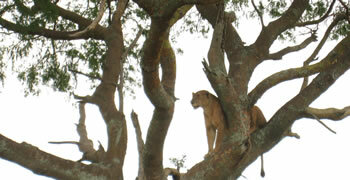 Bwindi impenetrable forest offers an intriguingly true African jungle experience. Its dense growth, vines and other vegetation make it impenetrable, mysterious and awesome as the sun breaks through; elegant helicon or lobster claw spreads its colorful petals. 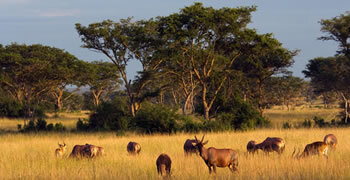 This is one of the richest areas for flora in Africa. The forest is home to about 330 mountain gorillas, half of the world's population of about 600 mountain gorillas It takes 8 hrs from the time you depart your hotel, you will carry packed lunch, and then have a village walk as we return back to the hotel for overnight on full board basis. This morning depart to Kibale Forest National park (Kisoro, Kibale Park is 493 km 8hrs journey). You will have lunch in Fort Portal town after visiting the Kings palace. Arrive Kibale in the evening for dinner and overnight at, Ndali or Primate Lodge (Luxury Option), Mountains of the Moon Hotel or Primate Lodge (Medium option) Rwenzori Travelers Inn (Budget Option). Morning chimps trekking in the Kibale forest. Kibale forest National Park is home to 13 primate species including the red colobus, velvets and Lhotse's monkey and Chimpanzees. The shady forests provide botanists and butterfly enthusiasts with a rare treat. For birders, 335 species of birds have been recorded including the guinea fowl, great turaccos and parrots. An estimated 600 chimps inhabit the forest. Community - based eco-tourism has been developed here, an array of native plants, animal’s foods, medicines and plant products are found here. Tree species like wild rubber trees, polita figs and candelabra euphorbia are common here. The trekking will last for almost 5 hours. Day 8: Kampala - Entebbe. Depending on your flight time, this is your day of choice and the available options include: a cultural tour of Kampala, a shopping spree before your transfer to the airport for flight back home. All accommodations as indicated, Gorilla tracking permit, Mountain hiking fees, Potter fees, Ranger guides fees, transport for the whole trip including transfers, all meals as indicated, chimpanzee tracking permits, entrance fees to all hiking points, village walk where necessary, All guide’s expenses, bottled water for the trip, All government taxes.